Mattis Commercial Park offers a prime location to start or relocate your business due to its great visibility, uncongested parking, room for growth, and ease of access. Current tenants in Mattis Commercial Park include Kitchen Bath & Cabinet, Springfield Electric, Sherwin Williams, Cramer Siding, Fastenal, AutoZone, and many others. 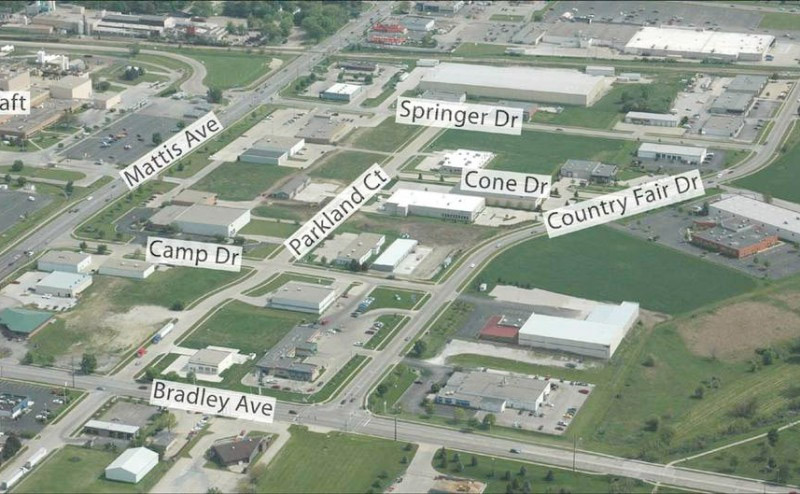 Mattis Commercial Park is located in western Champaign, and is bordered by Mattis Avenue, Bradley Avenue, Heritage Park and the Illinois Central Gulf Railroad. The park offers excellent access to I-57, I-72 and I-74, and is surrounded by a variety of restaurants and shopping. Additionally, Parkland College is located just northwest of the park. The real estate is sold “as is, where is” with no warranties expressed or implied. Successful bidder will be required to sign a real estate contract, and pay a 10% earnest money deposit immediately following the conclusion of the Auction. Closing will take place on or before December 5, 2014. Real estate taxes shall be prorated as of date of closing. Financing, if needed, must be arranged prior to Auction. Announcements made immediately prior to the Auction take precedence over any and all other information from any source. Sellers reserve the right to reject any and all bids. The auction may be cancelled at any time with or without notice. The information provided is believed to be accurate. However, it is subject to verification by potential Buyers. The Sellers, the Auctioneer, the Auction Company, and the cooperating Broker assume no liability for injury, errors or omissions. There are no warranties, expressed or implied, as to the information herein contained and it is recommended that all Buyers perform their own due diligence. Inspection made by appointment only with Coldwell Banker Commercial Devonshire Realty. Contact Tim Harrington @ 217-403-3302.